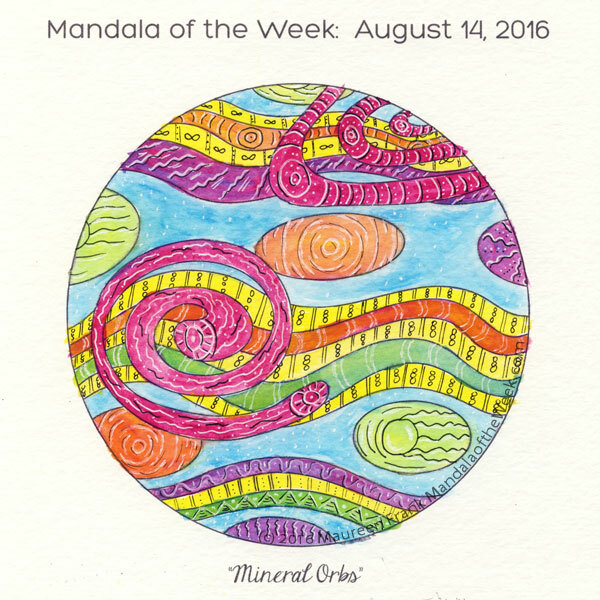 I present my coloring/painting of this week’s Mandala of the Week: Mineral Orbs (from Sunday’s MotD post). Using only the colors from the other five posts of this week’s theme (black, white, yellow, red/magenta, and blue), I painted this week’s MotW. Yet what do we see here? Green? Purple? Orange? Why yes, those colors are there as well…by mixing different combinations of red, yellow, and blue (the primary colors) I “made” green (blue/yellow), orange (red/yellow), and purple (red/blue)…(the secondary colors). I used black and white for details and doodles. Today’s mandala shows us how creative we can be when we make use of what we already have on hand to make what we need/want. Along with “things”, this also works with our thoughts and imagination. So what shall we come up with today?